Issues of the Louisburg College Student Newspaper are now online at DigitalNC.org. The available issues date from 1908 to 1998, covering the school’s transformation from an all-female institution to a coeducational one in 1931. The student newspaper underwent a number of title changes throughout the years, publishing as “Louisburg Echoes”, “The Gull”, “The Sea Thean” (a play on the two literary societies – the Sea Gift and the Neithean Society – that co-published the newspaper), and my personal favorite, the “Lo’ Co'”, before finally settling on “Columns” in the early 1940s. “Columns” is still published today as the school’s alumni magazine. The Spring 2012 North Carolina Digital Heritage Center newsletter is now available! Download or print a copy to keep up with news, featured projects, and more. 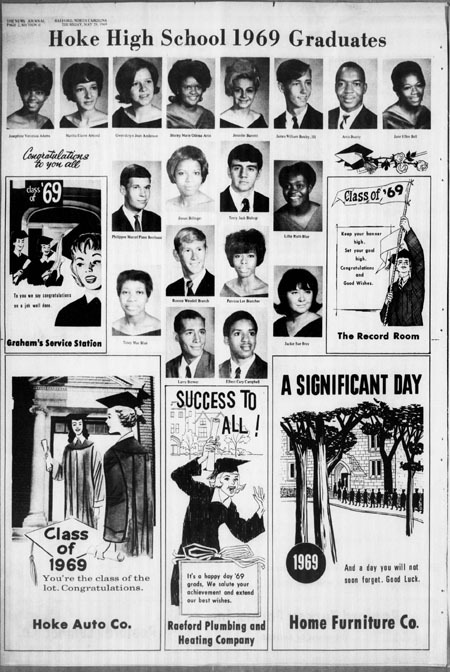 The issue of the News-Journal from Raeford, N.C. published on this day in 1969 includes photos of the entire graduating class from Hoke County High School. It’s a great example of a small-town paper reaching out to the local community, and also gives visual evidence of Hoke County’s success in finally integrating its public school system. Judging from a battle of the ads between Camel cigarettes and Chesterfield cigarettes in the Maroon and Gold, the student newspaper of Elon University, the 18-24 demographic was a priority target for ad men as early as 1936. Throughout Volume IX of the Maroon and Gold, spanning the 1935-1936 academic year, Camel regularly placed ads on the penultimate page of an issue, while Chesterfield secured space on the back page. Camel and Chesterfield were a North Carolina tobacco rivalry. The R.J. Reynolds Company, which produced Camel cigarettes, was based in Winston-Salem; operations of Liggett & Myers Tobacco Company, which produced Chesterfield cigarettes, at the time were located in Durham. Since the debut of Camel cigarettes in 1913, the Chesterfield brand had emerged as a strong competitor. In these 1936 ads from the Maroon and Gold, Camel appealed to college students’ strained budgets and even suggested that smoking Camels improved stamina while studying. 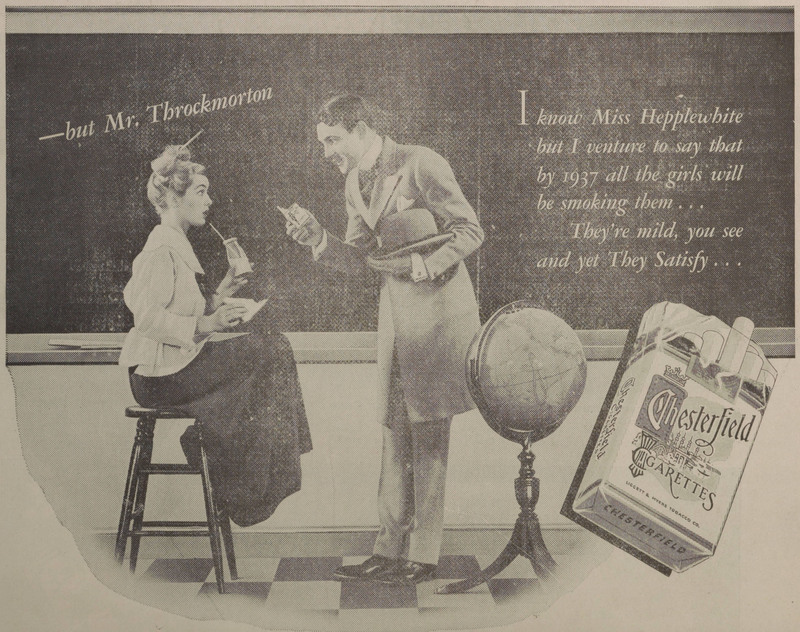 Chesterfield, on the other hand, attempted to entice college men and women alike with their cigarettes’ smooth taste and sexually suggestive ads. 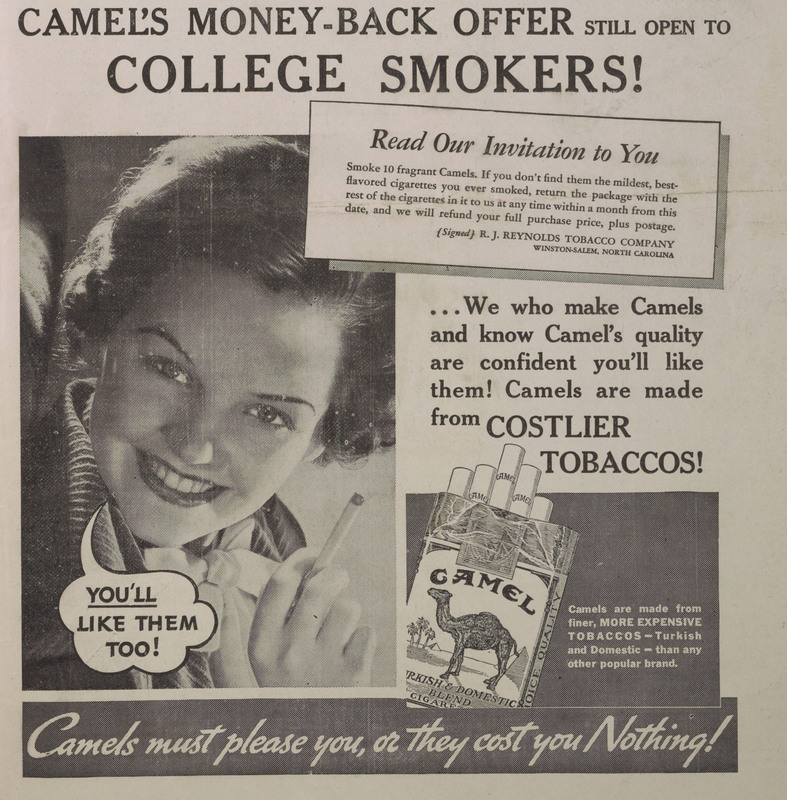 “Camel’s money-back offer still open to college smokers!” Maroon and Gold, February 15, 1936, p. 3. 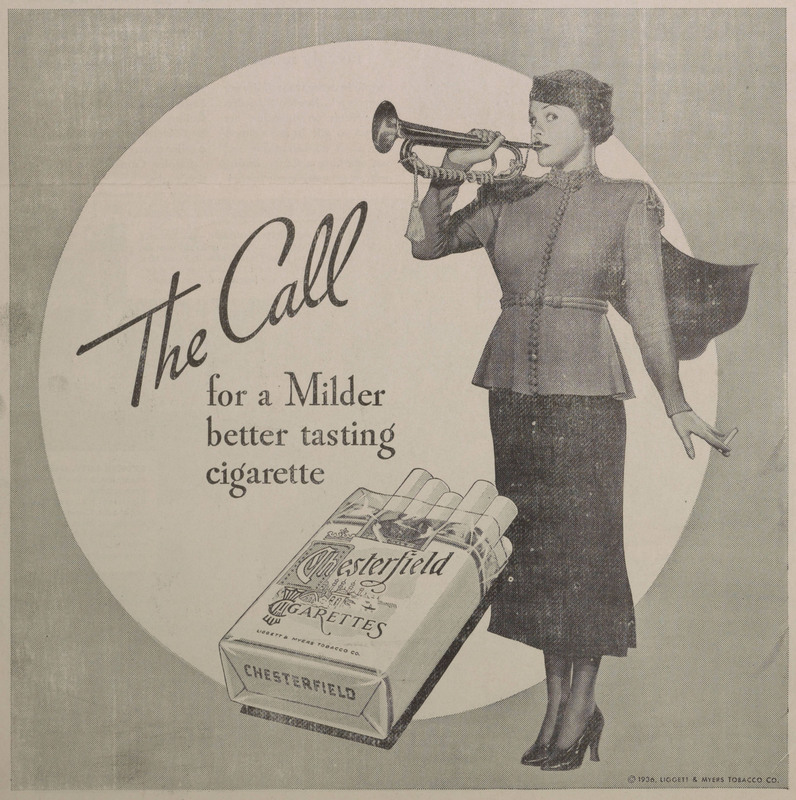 “The Call for a Milder better tasting cigarette.” Maroon and Gold, February 22, 1936, p. 4. 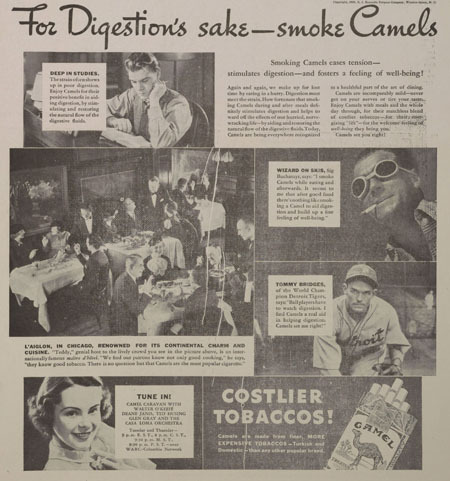 “For Digestion’s sake — smoke Camels.” Maroon and Gold, March 21, 1936, p. 5. “I know Miss Hepplewhite but I venture to say that by 1937 all the girls will be smoking them…They’re mild, you see and yet They Satisfy.” Maroon and Gold, March 21, 1936, p. 6. 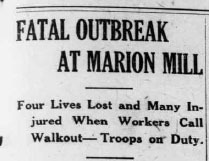 A selection of historic issues of the Marion Progress, a weekly paper from Marion, N.C., are now available in the North Carolina Newspapers collection. There are over 150 issues online, from the years 1916, 1929, and 1940. These years were selected by the McDowell County Public Library because of their coverage of major events in the county. There were devastating floods in the area in 1916 and 1940 and a major textile strike in 1929. 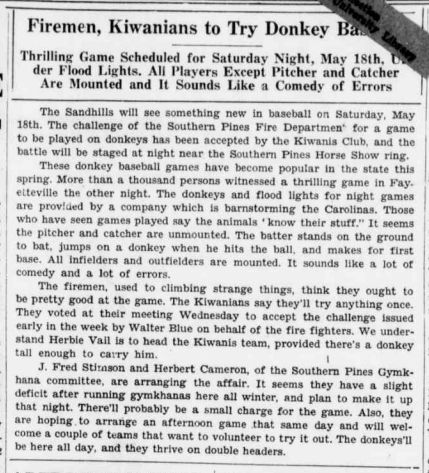 Firemen, Kiwanians to Try Donkey Baseball. 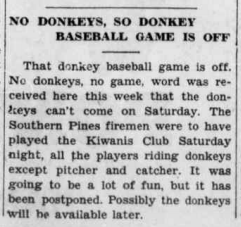 No Donkeys, So Donkey Baseball Game Is Off. No further explanation was given other than “the donkeys can’t come on Saturday.” I’ve pasted the two full articles below. Needless to say, we’ll continue to follow this story and report any updates as we get them. I’m pleased to announce that we have just loaded a dozen historic photos of Clayton, N.C. into the Images of North Carolina collection. Primarily from the early 20th century, these show businesses, schools, and a few people. 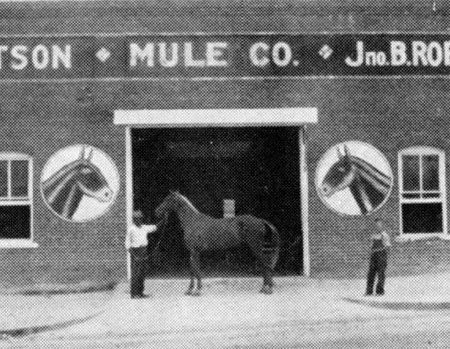 My favorite is the photo of the Robertson Mule Company, with its large images of mules right on the front. These photos are from the Hocutt-Ellington Memorial Library (Clayton, N.C.), and are part of a larger collection of town history. 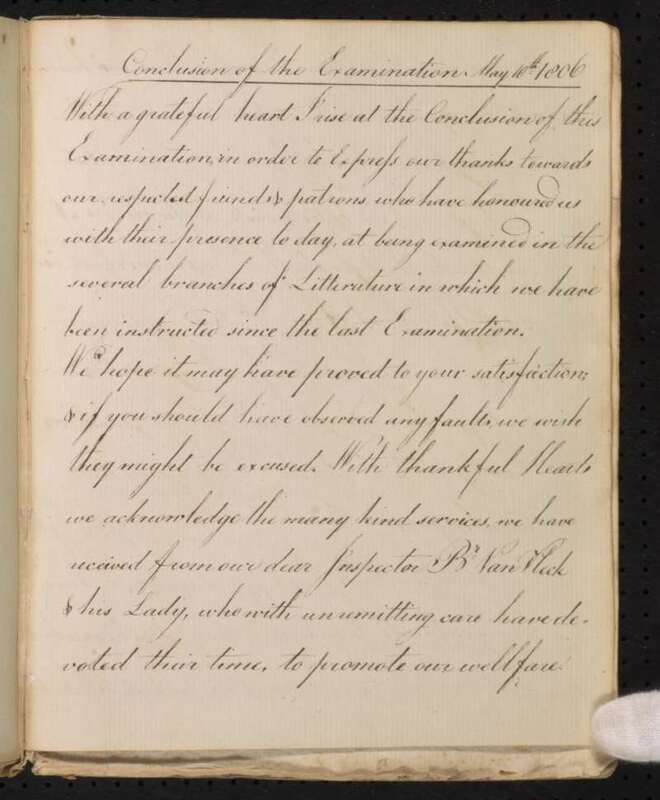 The four-page letter was bound at the end (pp. 359-362) of a volume of exams from Old Salem Museums & Gardens’ collection of student exercise books. We recently digitized an additional ten volumes, bringing the total number of volumes in the digital collection to twenty, and we will be adding more in the coming weeks! 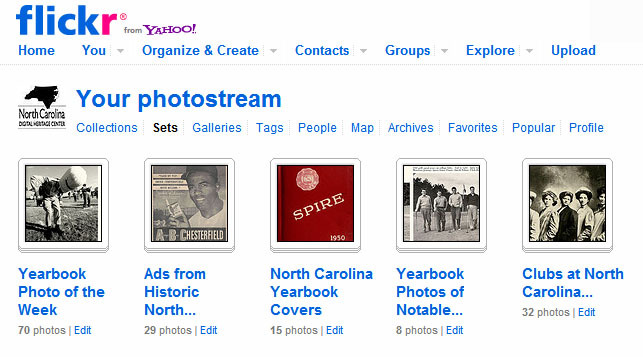 May marks the beginning of the North Carolina Digital Heritage Center’s presence on Flickr. Faithful followers of our blog or fans of our Facebook page will recognize some photos now presented on Flickr, and we will also be adding new content each week. In addition to making photos available from our Images of North Carolina collection, Flickr offers us the opportunity to extract images from our North Carolina Newspapers and North Carolina College and University Yearbooks collections in DigitalNC. There are many ways to discover interesting photographic images from our contributing institutions around North Carolina via Flickr. You may browse our photostream on Flickr, or subscribe to an RSS feed of our photostream (follow the link and paste the URL into your feed reader). If you prefer to have photos from a particular set come to you via your RSS reader, there’s a link to an RSS feed (paste the URL into your feed reader) at the bottom of each set page. What kinds of photos would you like to see from the North Carolina Digital Heritage Center on Flickr? Graduation photos? Baseball photos? Summertime photos? Let us know in the comments! Yesterday, we learned that the North Carolina Yearbook Index, available on the popular and super-helpful genealogy site, NCGenWeb, now includes over 30,000 names. Impressive! Most of the yearbooks indexed have been digitized by the NC Digital Heritage Center for the North Carolina College and University Yearbooks project. The index includes names, dates, and schools for the senior classes from more than 30 different institutions around the state.